@NCATAGGIES finish 1, 2 & 3 in the women's 100mh with Madeleine Akobundu, TeJyrica Robinson & Paula Simon. 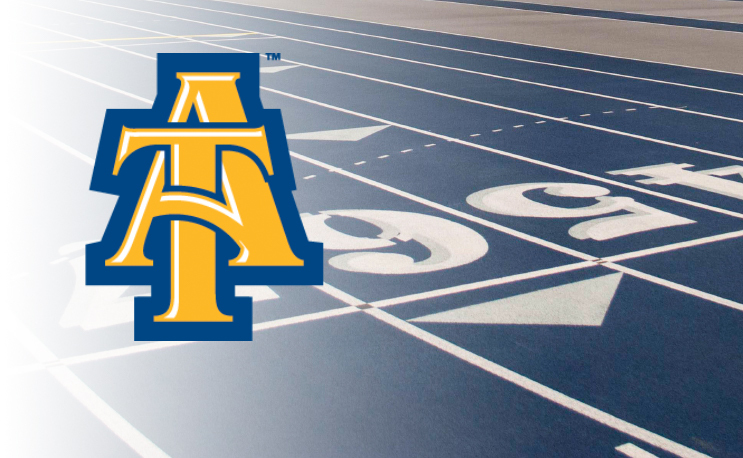 Field events start at 9 a.m., tomorrow at Irwin Belk Track … track events start at 11 a.m.
@NCATAGGIES Rodney Rowe runs a blazing 10.10 to win the men's 100m at the 2019 Aggie Invitational at A&T's Irwin Belk Track. Meanwhile, Kimtai made a spirited comeback effort in the 800 to win. It looked as if Hampton’s TayvonBurris had a good lead as the runners made the turn for the last 200 meters of the race. But running in third, Kimtai made a push and was able to sustain his sprint as he passed Burris just before the finish line to finish in 1:50.59. Burris finished in 1:50.69. N.C. A&T honored 12 outstanding seniors on Friday. It is a senior class that has won three men’s MEAC indoor titles, three women’s indoor MEAC titles, two outdoor men’s MEAC titles and one women’s MEAC outdoor title. The class also includes White, an indoor national champion in the women’s 200m. The class also includes numerous NCAA indoor and outdoor championship qualifiers.